Dog Profile: Perlanera Vovs Backa Muppet is a nice black and red female with an excellent temperament. She gets along well with other dogs and loves people! She is the granddaughter of VA2 Quattro von der Partnachklamm and the great granddaughter of VA1 Zamp vom Thermodos and V Tyson vom Kottersbusch. Perlanera is linebred 3,4-4,5 VA1 Zamp vom Thermodos, 4-4 VA2 Quenn vom Loher Weg and 5-5 VA Dux della Valcuvia. 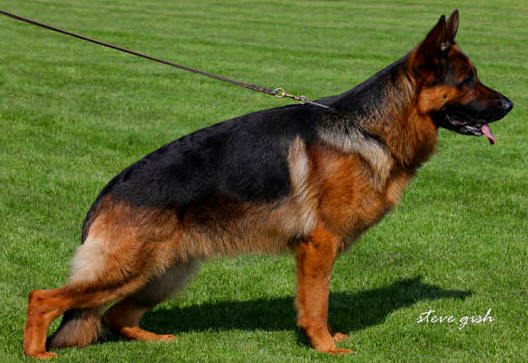 She will pass along her excellent temperament and healthy bloodlines to her puppies. Perlanera has been tested for degenerative myelopathy (DM) and is clear so her pups will not be at risk for DM. Her hips and elbows are rated A1/A1 and she has passed her OFA cardiac clearance.